A wooden pavilion is certainly the perfect way to change the appearance or functionality (or both) of your outside space! People often think that choosing the right garden building is the most challenging part of the garden makeover process, which is often true, of course. However, it is also a challenge to create the right ambience by completing the intended design and usage ideas, as most people find it difficult to create a plan and imagine the final result. 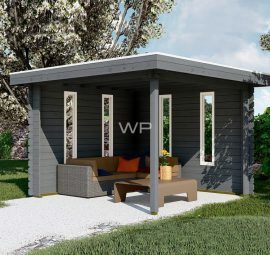 As with choosing the right wooden pavilion in terms of size and style, turning your pavilion into a cosy and functional living space will also require ideas, imagination and planning. To make your garden makeover journey easier, below we have listed 5 great ideas for transforming your garden space with a wooden pavilion! Setting up a relaxation area in a wooden pavilion is the most popular way of using this particular timber structure. The main reason for this is not only related to the favourable designs available and the technical qualities of these timber structures, but also to their size. 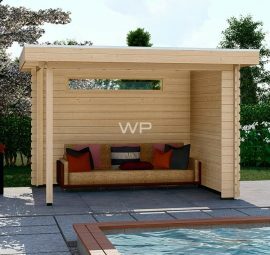 A wooden pavilion relaxation area is often the most convenient solution for city gardens and their limited space. 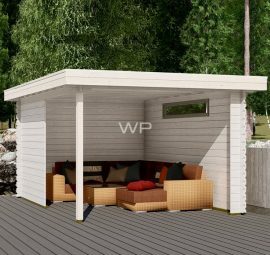 Whether you have been planning to set up an outdoor relaxation area for a while now or have just come to terms with the fact that you can’t fit a multi-room studio in your garden, there are a few tips to keep in mind when it comes to setting up a wooden pavilion relaxation area. For example, whether partially or fully enclosed, wooden pavilions are usually light and airy timber structures and you should take this into consideration when you’re creating the interior design. Ideally, try to avoid creating a boundary between the lounge area and the garden. Furthermore, a timber structure provides a beautiful wooden interior, so you should plan your interior design in a way that complements and highlights this amazing feature. 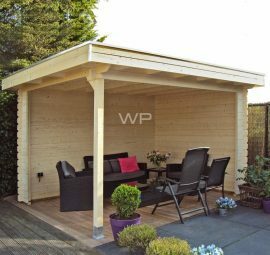 If your garden has enough space to site an ‘upgraded’ wood pavilion relaxation area, then all you have to do is decide which extras or luxuries you want to incorporate into it. If we assume that a standard relaxation area is a beautifully decorated wooden pavilion with a cosy set of garden furniture, then an upgraded version must have something that takes your outdoor space to the next level. One of the most popular garden design trends is the inclusion of an outdoor firepit or fireplace. This is an addition that is both beautiful and functional. Imagine throwing a garden cocktail party in a wooden pavilion with an outdoor fireplace – it will definitely be the main topic of conversation, while also keeping your guests warm and cosy when the sun goes down! If you prefer water to fire, you could opt for a fountain or a water wall instead, which will definitely give your seating area that Zen vibe. However, if you are looking for something even more unusual, you could always opt for the bespoke pavilion option! For example, you could design an L-shaped garden building or an octagonal wooden pavilion to create a unique garden landscape. If you love cooking and entertaining, then an outdoor kitchen and dining area in a wooden pavilion might be worth considering. The best thing about this idea is that you get a multi-functional addition to your garden, combining both a cooking area and a dining or seating area. Planning an outdoor kitchen is quite similar to planning a normal kitchen: the most important thing to decide – before finding the right timber building and planning the décor – is whether to cook and entertain in a single space or in separate areas. 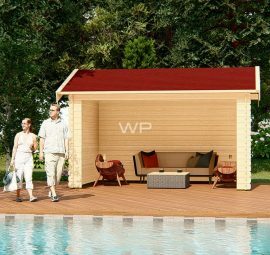 Even if you go for the more unusual option – the separate spaces – the variety of wooden pavilion options on the market is impressive, and therefore it shouldn’t be difficult to find one that’s just right for you. Meanwhile, in terms of the décor and functionality of your outdoor kitchen, you can either opt for a standard gas BBQ or add a little luxury with an outdoor pizza oven. Whether you plan to use it as an outdoor lounge or as a kitchen, a wooden pavilion will provide you with that extra outdoor living area that most of us would find quite handy. 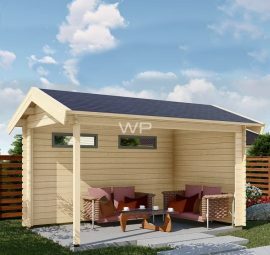 However, a wooden pavilion can also be designed and built in such a way that it becomes part of your house. A fully open timber structure, for example, is great for creating a lean-to veranda or a canopy that’s attached to your house – this way you can seamlessly blend your indoor space with outdoor space. There are a variety of timber structures that would work as the perfect extension to your house, but if you’re looking for one that is both functional and opens up your garden, it is advisable to opt for an open gazebo with glass sliding walls. This will create that seamless transition between indoors and outdoors, while also providing a space that can be used year-round. Meanwhile, when it comes to decorating, you can simply follow the style of your house, so it really feels like part of it. There are no limitations on how to use or incorporate a wooden pavilion in the garden – it’s such a versatile timber structure that it can be used for almost anything! If your outdoor space doesn’t really need a lounge or an outdoor kitchen, but you have always wanted a space to relax in after a long day at work, consider installing a hot tub in your wooden pavilion! Such a modern and elegant addition to your garden will definitely ensure you spend more time outdoors and will look absolutely spectacular! In fact, some people find a hot tub to be a decorative element in itself; however, if a hot tub doesn’t really complement the classical English-style garden that you’ve been working on for years, a traditional wooden pavilion can help you blend it in! Would you like to transform the look of your garden with a wooden pavilion? 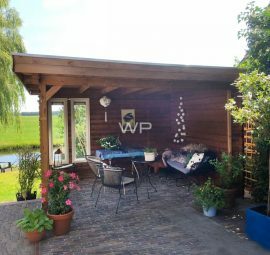 Take a look at the range of garden buildings available at www.woodpro.co.uk!